Current downloadable PC / Mac version is 4.7.3. Current online version is 4.7.3. The online version is available directly in your browser here. 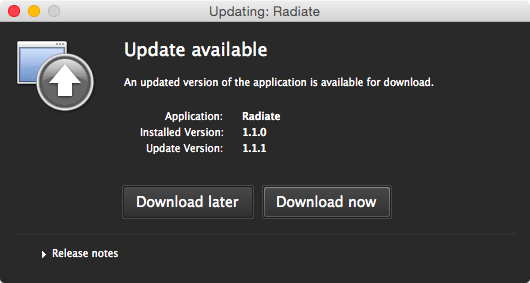 Click on the icon below to install the desktop version of Radiate. If you would rather download the PC or Mac file you can do so as well. If you are on Mac the easiest downloader is the DMG or App file (inside of a zip file). It’s available here. Unzip the archive. You will either have a DMG file or an app file. If the zip contains a .dmg file, double click on it to start the installer and follow the onscreen instructions. If the file is an app file (shows the Radiate icon), drag the icon into your applications directory. For Mac or PC using Adobe AIR click here. Once downloaded double click on it and follow the onscreen instructions. The advantage of the Adobe AIR installer is that you can easily be notified and updated when updates are released. Click install on the update window. It may require a restart. This is a self signed certificate. Apple shows you this alert as a precaution to installing any software online.